Sunday Blog: A bit about Worldbuilding and Maps. I am not a cartographer but I’m trying to learn the skill because lets be honest a traditional fantasy needs a map. I mean who doesn’t love a map in a fantasy novel. 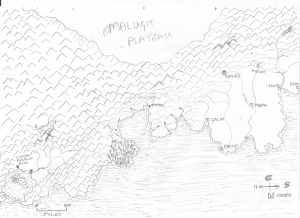 So I’ve started by attempting to draw a map of the region where Shattered is set. My first attempt was… hum…. Well the coastline is okay but I kind of went a tad overboard with the mountains. Okay, a lot overboard with the mountains. So now I’m trying again. 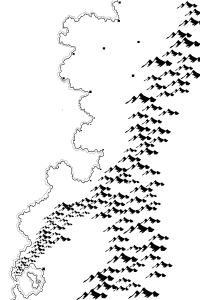 (And I’m cheating because I downloaded a set of map brushes for Gimp but the mountains look better then my by hand attempts. I’ve also re-orientated it so North is now at the top. One thing to bear in mind is that this is a Southern Hemisphere landmass. In an ideal world I’d hire one of the excellent fantasy cartographers out there for to do a professional job but that requires money I don’t have, so I’ll do my best for you all so we don’t get lost. Some key points on the map to hopefully whet your appetite. Those square dots in the north are the Arissi City States. As you may gather from the name this is a group of generally politically separate but culturally united cities. They are around the bronze age technologically but this is because they lack a reliable source of iron ore rather than lack of knowledge of iron working. They are aware of iron and import some iron. While generally politically independent they have made a military which means they share a standing army, one of the first professional armies in their world, to which each state contributes a proportion of the troops. The Arissi are currently over populated and in order to feed their population the army is sent out to gather tribute from their neighbors. As you can imagine their neighbors aren’t too impressed by this behavior. In the south of the map you will see a lagoon and plain surrounded by mountains. That is Cursed Anvalei. According to legend the Anvaleika were the chosen children of the Anvrin, the eldest of the gods. He blessed them with magic and longevity beyond normal humans and they prospered in their temperate and fertile home. Unfortunately, say the same legends, he fell, and when he fell they fell with him becoming tyrants and monsters and conquering a vast empire at his behest. The other gods made war upon him and eventually he was stripped of his power and imprisoned. His name is no longer spoken and he is referred to only by titles such as the Empty One. The Anvaleika for the most part refused to repent of the evil they had committed in his nae and the gods destroyed them. Most died – only those who were too young to bear guilt and the few adults who repented were spared and even they were driven from their home. No one has been there since. Anvalei is forbidden to all humans by the gods. Ghosts haunt the mountain passes and tear apart any who dare them and a malestrom destroys any vessel that risk the narrow passage to the lagoon. There we go, a bit of stuff about Shattered. I hope you like it. Bah. if you think that is bad then I need you to make me maps. LOL. I am terrible with maps and quickly get consumed in getting details right, which I usually cannot get them right.